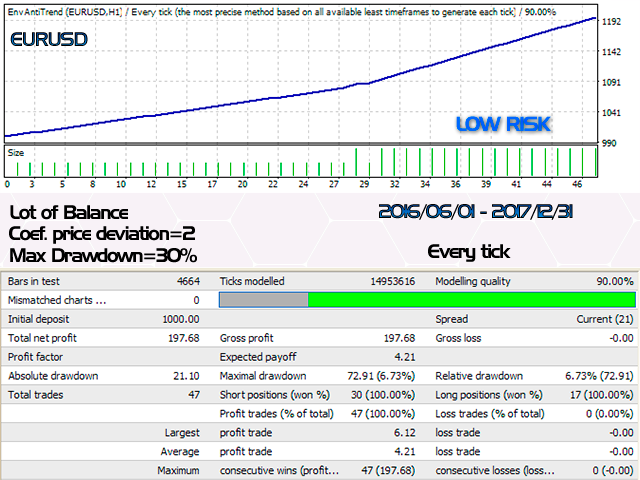 AntiTrend Deviation is a MetaТrader 4 trading robot. Trading is based on the principle that the price has a wave nature, and it is often confined within a certain price range, which it may leave, but often returns to it. The EA determines the moments when the price leaves a price range and, under certain conditions, opens a trade against the current movement and closes it when the price returns to the price range. The good results are achieved on EURUSD. For safety reasons, physical Take Profit and Stop Loss levels are used in conjunction with the virtual Stop Loss. Minimum deposit: $1000 or above. 5(3)-digit quotes with spread size of 0-5 (0-50 for 5-digit) points. Recommended account type – ECN. Stop Loss(points) - stop loss in points of the current instrument. 0 - not used. Trade Time limit - time limit for the EA operation. Buy Level deviation - level of price deviation (in points) from the price range, at which a buy order is opened. Sell Level deviation - level of price deviation (in points) from the price range, at which a sell order is opened. Coef. price deviation - coefficient determining the upper boundary of the range, after entering which an order is opened. Max. Drawdown,% - virtual Stop Loss, % of the balance, at which a position is closed. Apart from EURUSD, other currency pairs may be added, but it is necessary to optimize the Buy/Sell Level and Take Profit parameters. When working with multiple currency pairs, it is recommended to use the ММ =Constant Lot mode! Do not forget that increasing the profit increases the risks of trading! Do not overly decrease or increase the value of Max. Drawdown. Especially, when the EA works on multiple currency pairs. The recommended value is around 30%. It is recommended to disable the EA before important news releases or to set the Max. Spread to at least 50 (for 5-digit quotes).